Real estate investors gain numerous opportunities from assisted living investments. After all, assisted living facilities are constantly being built across the United States. As a real estate investor, you need to recognize how many citizens need assisted living services. More so, understand that this number rises on a daily basis. Today’s senior citizens are also more active than those before them. Because they need different accommodations, more facilities are being built and new opportunities are presented to investors. You can even use your IRA to invest in real estate properties. Continue reading to learn about the top assisted living investment opportunities to take advantage of today. One of the best assisted living investment opportunities to consider taking advantage of is senior living REITs. For real estate investing newcomers, REIT stands for real estate investment trusts. Since they were created based on mutual funds, they provide regular income streams. They also offer investors diversification and long-term capital appreciation. Hence, investors who get involved in REITs expand their portfolios rather easily. Set yourself up for profitable future endeavors by investing in this assisted living investment option. Another popular assisted living investment opportunity that real estate investors profit off of is facility leasing. As with any real estate investment, there are levels to investing in assisted living facilities. 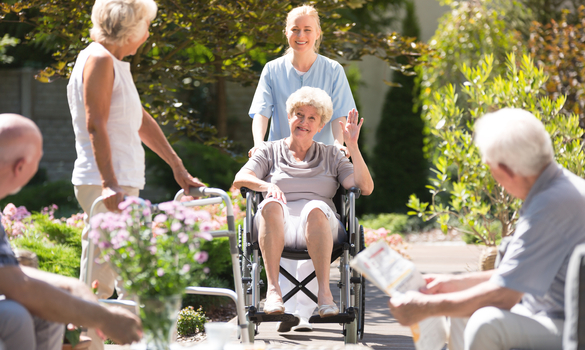 You can choose to own and operate an assisted living facility and the business. This is a great option if you wish to maintain complete control over the operations of your investment property. However, many investors prefer to put forth less work in their projects. Such investors profit off of leasing properties to senior living facilities. Furthermore, they lease the properties for double the fair market rent. Hence, you can earn a good return through facility leasing. Many investors fail to realize the opportunities they gain from assisted living investment marketing techniques. In order to properly market an assisted living facility, you need to target both the people who will be living in the homes and their family members who will be putting them there. The most successfu8l marketing strategies target the family members more than the prospective tenants. If your marketing team successfully sells not only your assisted living investment but your name as well, you can gain future investment opportunities. Then, you can continue earning money throughout your investing ventures. Also, investors receive exposure to profitable assisted living investment opportunities when they choose to enter Southern California’s market. While the real estate is growing in various locations around the United States, California’s market offers investors better returns. The primary reason behind this lies within the high rents. Since Southern California’s rent prices are significantly higher than other areas, senior living tenants pay higher fees for the facilities. Moreover, a high amount of retired people favor California because of its scenic, relaxing qualities. If you want to guarantee yourself a high assisted living investment profit, look to Southern California for opportunities. Finally, there are emerging international investment opportunities as well. Use these opportunities to broaden your portfolio and earn good returns simultaneously. Many countries are trying to bring in foreign direct investment for senior care. China is one of these countries for good reason. Their population grows at a rapid rate. As their population increases, their number of elderly people in need of assisted living grows. In hopes of providing citizens with the care they need, insurance companies in China are building retirement communities. These insurance companies need the help of foreign investors to maintain them. If you want to expand your portfolio, take advantage of the forthcoming international assisted living investment opportunities. To fully benefit from them, learn how to invest in startups. As a real estate investor, you can increase your profit by taking advantage of the top assisted living investment opportunities. For instance, familiarize yourself with senior living REITs and learn successful strategies to make a good return. Consider facil8ity leasing instead of owning both the facility and the business. Use the associated marketing opportunities to gain new connections. Look at Southern California’s market to boost your profits. In addition, consider the emerging international investments to expand your portfolio. These are the top assisted living investment opportunities that produce positive outcomes.